I’ve read a few incomprehensible books before. The one that comes immediately to mind is “Snow White” by Donald Barthelme. This is what we’d call “a book written for English professors,” in regards to its impenetrable literary message buried under opaque literary references and disturbing sexual renditions of the Snow White story. In the end I had no idea what I had read, and what was its purpose. But here’s where Murakami’s book is different: although I may not have understood the story entirely, I sure did enjoy the ride. I think a lot of people read books in order to get to the end. Sure, they enjoy the adventure and the ups and downs along the way, but really it’s the end that makes or breaks opinions; after all, it IS the last part of the book you see, and therefore often the most memorable. Yet Murakami is a unique writer in that the end is often the least important part of his books. Problems are left unsolved, mysteries are left mysteries, and people are left in emotional limbo. This has the potential to piss some people off. Why invest in a character’s problems if they don’t get solved? Anyway, I’ll admit I’m biased; Murakami is one of my all-time favorite authors, along with Khaled Housseini, David Mitchell, William Faulkner, and Stephen King. Although I may not understand everything in his stories, I have always enjoyed the journeys and places he takes me, the people he shows me, and his talent for bleeding the fantastical into reality, which makes me wonder how fantastical some things really are. In all, I absolutely recommend this book for Murakami fans, and for first timers, just go into it expecting something different than your regular old story. Let it take you where it will. 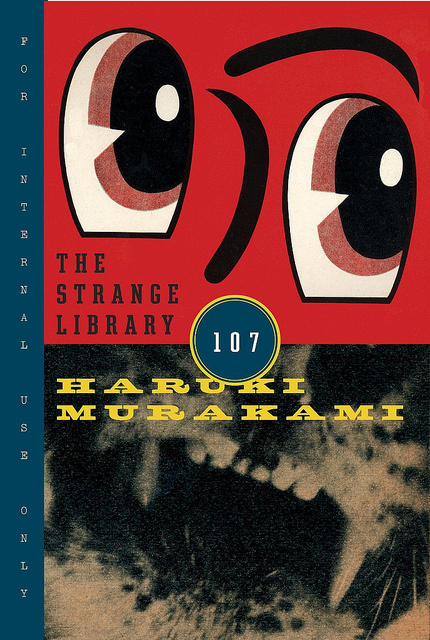 This entry was posted in Book Reviews, Fiction and tagged book review, books, fiction, Haruki Murakami, The Strange Library. Bookmark the permalink.